Mike Mignola is one of the preeminent comics creators of the past 25 years and Hellboy, his iconic creation, struck a meteoric chord with fans from the very start and has not abated in the 20 years since his debut. Featuring a variant cover from Mignola himself, only available at SDCC! Watchmen has been called the greatest graphic novel of all time. Alan Moore andDave Gibbons created a story and graphic narrative unlike anything that preceded it, and revitalized the entire art form that followed. Featuring a variant cover from Dave Gibbons, who’ll be signing all 5 days of the Con at the IDW booth! IDW, in cooperation with MARVEL Comics, proudly presents Walter Simonson’s The Mighty Thor: Artist’s Edition, collecting seven complete issues of Simonson’s transcendent run on The Mighty Thor, including the groundbreaking first arc that introduced Beta Ray Bill. Featuring a variant cover by the Mighty Walter Simonson! Also, look for the show debut of the Steranko Nick Fury: Agent of S.H.I.E.L.D. Artist’s Edition HC! 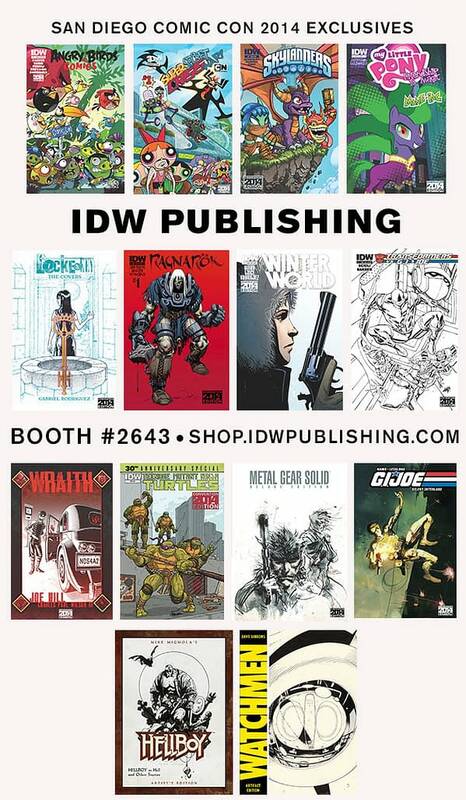 And watch for Mike Mignola, Dave Gibbons, Walter Simonson, and Jim Steranko ALL signing in the IDW booth! With a matte cover and spot-varnish treatment of Walter Simonson‘s menacing Thor sketch, this convention exclusive will not last long! Relive the acclaimed series’ frightful beginning in black & white for the first time! Gabriel Rodriguez’s original line work is on full display in this very special convention exclusive! This convention exclusive displays an original blue-line pencils and inks cover by Gabriel Rodriguez for the show debut of this Locke & Key covers collection! This special convention variant features a bloody exclusive cover by Locke & Key co-creator and artist, Gabriel Rodriguez for Joe Hill’s original new comic miniseries hardcover collection. Ghostbusters artist Dan Schoening provides a convention exclusive cover celebrating the madness that is Comic-Con for Brian Lynch’s newest IDW project! All-new stories based on the Chuck Dixon/Jorge Zaffino classic with Dixon returning to script andButch Guice doing some of the best work of his illustrious artistic career. Convention exclusive cover featuring Wynn, by Will Rosado! Also, watch out for the blank sketch edition of Transformers vs. G.I. JOE #1, as well as the three variant covers on sale with Diamond Comic Distributors! The convention exclusive of G.I. JOE #21 remastered from the original art and lovingly recolored with Larry Hama’s original layouts and Steve Leialoha’s finishes featuring a homage cover to the famous issue by superstar artist, Ashley Wood. Don’t miss out on the special convention exclusive cover by The Manhattan Projects artist, Nick Pitarrafor this spectacular anthology of all-new tales from the comic creators who have most influenced the Turtles over the decades! A Blank Sketch Cover also available! This black & white convention exclusive cover by Kevin Eastman matches the four previous volumes that have all had the same treatment as convention exclusives. Featuring an 8 page story unavailable ANYWHERE ELSE! The villainous Mane-iac takes over the cover to this convention exclusive that comes complete with your first look inside the My Little Pony Annual 2014, featuring the debut of the super-heroic Pony Pack! Cosplaying piggies grace this convention exclusive cover by Jon Sommariva for the world’s most popular mobile game franchise comic book debut! Featuring fun-filled, action packed stories from Eisner-nominee Jeff Parker and Eisner Award–winner Paul Tobin, this is a must-get book! The San Diego Convention Center is invaded by characters from across the Cartoon Network universe in this convention exclusive variant cover by series artist, Derek Charm! Grab this convention exclusive cover by the creator of Johnny Bravo, Van Partible, for the first of five one-shots tying directly into the Super Secret Crisis War! The comic debut of Skylanders! Unavailable anywhere else!! This Zero Issue focuses on all your fan-favorite characters and featuring a prequel story tying directly into the new Skylanders Trap Team videogame. The convention exclusive cover by Fico Ossio and David Garcia Cruz features Spyro, Stealth Elf, and Trigger Happy. From Count Kriegstein’s imagination straight to your hearts is PASCHABORG 001! Exclusively available through IDW Publishing, PASCHABORG 001 is Ashley Wood‘s 2014 San Diego Comic-Con offering. We suggest you pre-order yours now because she won’t last long! The highly sought after keys made by Skelton Crew Studios, modeled after Gabriel Rodriguez‘s designs in Locke & Key, return to the IDW Booth at San Diego Comic-Con with the specially plated edition of the Alpha Key.